Farrell was a topographical painter and etcher based in Glasgow where he exhibited extensively at the city’s Institute of Fine Arts. Additionally, he exhibited at the Royal Academy, London and at the Walker Art Gallery, Liverpool. 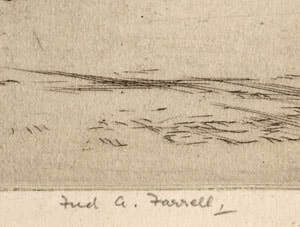 Largely self-taught, Farrell received encouragement in his printmaking from his friend, Muirhead Bone.